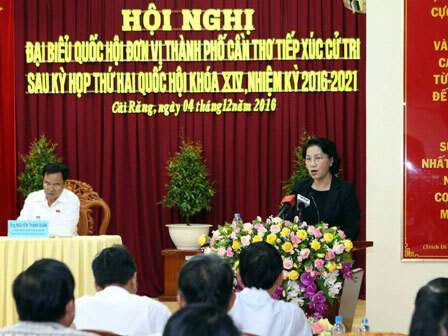 National Assembly Chairwoman Nguyen Thi Kim Ngan and the NA deputies of the Mekong Delta city of Can Tho on December 4 met with voters in Ninh Kieu and Cai Rang districts to inform them about the outcome of the 14th NA’s second session. Voters called for more investment in the Mekong Delta, including Can Tho city. The State should have policies to improve the living conditions of people in remote areas, on developing the national rice brand name and addressing school violence, they said. Acquiring voters’ opinions, the NA Chairwoman said investment will be poured into building key roads in Can Tho to ensure its connection with other regional localities. Regarding voters’ worry about high public debt, Ngan said the NA will increase supervision to keep the public debt under 65 percent of the GDP. She also underlined the Party and the State’s efforts in corruption prevention and control, saying that the NA Standing Committee is assigned to issue legal documents on punishing violating officials even when they retire or move to other position. The NA leader also talked with voters about the lack of jobs for graduates and traffic accidents in the locality. The same day, the top legislator visited the Tan Cang – Cai Cui port in the city./.